• How can we reduce risk for an outage or arc flash event? • What kind of project is required to fix my problems? • Is total replacement my best option? 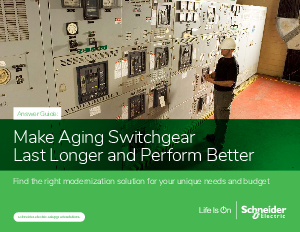 Find answers in "Answer Guide: Make Aging Switchgear Last Longer and Perform Better." Learn the benefits and how-tos of switchgear modernization and see easy-to-install solutions for any OEM's equipment.